Solar-array technology, driven largely by the demands of high-power direct broadcast communications satellites, has advanced considerably over recent decades. Previously, conversion efficiencies of only around 10% were typical for arrays made with crystalline silicon. Nowadays, efficiencies of upwards of 15% are more typical, with laboratory demonstrations of cells around 25%. These high efficiencies require multiple-layer cells with different conversion materials matched to different parts of the optical spectrum. Among the environmental degradation mechanisms of solar arrays are radiation damage (principally to the charge-carrying characteristics of the semiconductors), UV damage (typically by opacification of coverglass adhesive), thermal effects (flexing leading to failure of cell interconnects) and mechanical damage by dust or debris impact. The latter aspect is probably of most relevance for planetary landers. Figure 9.4. 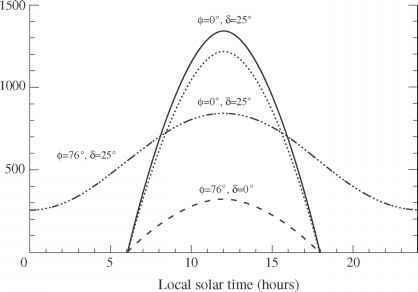 Solar power available on an airless planet at 1 AU from the Sun (S = 1340 Wm—2) as a function of time, spacecraft latitude (0) and solar declination (<5, i.e. latitude of the subsolar point). Solid line is for both the Sun and the lander at the equator giving a 12 hour day. The dotted line shows a lander on the equator during summer or winter, with the Sun 25° away from the equator. With a polar lander (0 = 76°) the power can be zero all day during polar night (8 < —14°); during midsummer (dash - triple-dot) there can be illumination all day, and indeed the daily averaged energy (the area under the curve) is highest for this situation. The curves represent the direct sunlight on a flat, horizontal plate, with no atmospheric absorption, scattering or surface reflection losses, all of which could be significant. location of the vehicle on the rotating planetary body on which it sits (Figure 9.4). Depending on the planet's obliquity and the local season, the Sun may be perpetually above the horizon, never, or somewhere in between. In this latter usual case, the vehicle will undergo profound thermal cycling and require significant battery capacity to perform operations or even maintain keep-alive power and heating at night. The performance of photovoltaic cells varies with the temperature of the cells, the level of illumination, incidence angle, shadowing and scattering, and radiation damage. Incidence angle effects include not only the obvious projected area effect, but also the increased Fresnel reflectivity of surfaces at low incidence. Cells operate better at low temperatures, developing a slightly higher voltage. 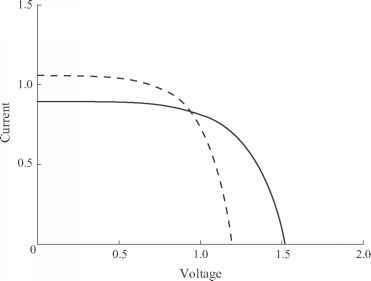 The voltage - current characteristic of a cell is shown in Figure 9.5. 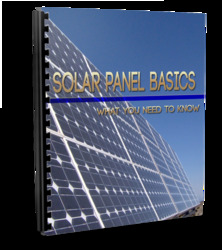 Usually a control circuit called a peak-power tracker is used to present the appropriate impedance to the solar array such that it operates at the knee of the curve. Usual figures of merit for solar power performance are m.
Figure 9.5. 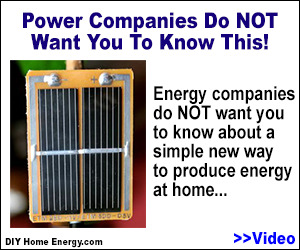 Output from a typical solar cell. Depending on the impedance presented by the spacecraft's power-conditioning circuits to the cell, it will operate somewhere along the solid curve for given conditions of illumination. The area of the rectangular box defined by the operating point and the origin determines the output power - this is maximized at the knee of the curve. The dashed curve shows the different operating characteristics of the cell at higher-than-normal temperatures. cell. Part of a cell's area is obscured by electrodes, and some space between cells is needed for interconnects, diodes, hinges, etc. The active fraction of an array area might therefore be 90% or less. Care needs to be taken in designing a system for a planetary environment. For example, the spectrum of light reaching the cells through the dusty Martian atmosphere may be rather different from that of the unfiltered Sun, and thus the spectral responsivity of the cells can be important in predicting the degradation to dust loading (e.g. Landis et al., 2004). In specific cases, rather good performance can be obtained. For example, the Sojourner rover had a single array of area 0.22 m2 providing 16.5 W at Mars noon or 45 W at 1 AU. The impressive performance of 204 W m- 2 is due in part to the use of very efficient GaAs on Ge cells, and in part due to the high active area fraction, since there were no hinges, etc.